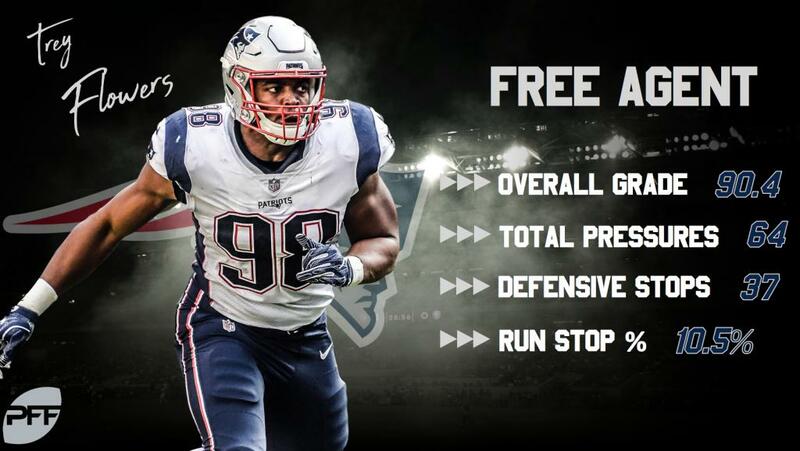 Dee Ford, Demarcus Lawrence, Frank Clark, Jadeveon Clowney, and Trey Flowers are all big names expected to either test the free agent waters or receive the franchise tag. Za’Darius Smith, Preston Smith, Shaquil Barrett, Dante Fowler Jr., and Ezekiel Ansah fall closely behind in a tier behind the top guys. Nick Bosa, Josh Allen, Brian Burns, Montez Sweat, Zach Allen, Jachai Polite, and Clelin Ferrell are all names to know in the 2019 NFL Draft. Talent is available at edge defender this offseason, available in droves considering current prospects in free agency and the draft. However, New England Patriots’ Flowers can’t get lost in what has become a sea of talent; he’s one of few at the helm. Of the 68 NFL edge defenders with 1,200-plus snaps in the last three regular seasons (2016-18), Flowers ranks ninth in overall grade (88.7) and run-defense grade (84.8) and his best season to date for the 25-year-old veteran came in 2018, as he earned career-highs in overall grade (90.4), run-defense grade (88.5) and pass-rush grade (80.6). Flowers’ 25 defense stops in the run game ranked tied for eighth among qualifiers. Also, his run-defense grade on early downs (90.1) ranked third among all edge defenders. His run defense has been consistent year over year in the NFL, and his high-end success even dates back to his college days with Arkansas. In his last collegiate season with the Razorbacks (2014), Flowers led all edge defenders in run-defense grade (90.9) and tied for second in total defensive stops (35). His 12.1 run-stop percentage ranked fourth in the FBS, as well. In addition to his run defense, Flowers brings elite versatility to the table. He has played the fourth-most defensive snaps away from edge defender in the last two years and earned an 83.0 overall grade in the process, ranking eighth among qualifiers. Rushing the passer away from the edge, Flowers wins with the best of them. He’s tied for seventh in pass-rush win percentage (16.1) and ranks fifth in pass-rush grade (77.0) when rushing the passer away from the edge in the last two seasons. Flowers’ pass-rushing ability doesn’t separate him from the pack, however. Removing screens, play-action dropbacks, trick plays, defensive stunts and blitzes from his pass-rush snaps, he’s earned just 50 pass-rush wins across 285 such snaps (17.5%) in the last two years. Compared to the 43 edge defenders with 200-plus such snaps, he ranks 23rd in pass-rush win percentage and 26th in pass-rush grade (76.3). The two-year leaders in pass-rush grade when the aforementioned qualifiers are applied are Joey Bosa (91.5), Von Miller (91.0) and Khalil Mack (90.9). Pending free agent edge defenders Lawrence (90.0), Ford (89.7) and Clark (87.6) all rank inside the top-12. Of course, Flowers’ position on the list in no way pits him as a below average pass-rusher in this league. His 81.3 two-year pass-rush grade ranks inside the top-20 among qualifying edge defenders, and his 17.1 pass-rush win percentage ranks 14. He’s good, if not great when attacking the quarterback – he’s just not one of the league’s best and hasn’t ranked inside the top-10 pass-rush grade once in his four years in the NFL. Flowers eats away at his good-not-great pass-rushing ability with his run defense and versatility, specifically his ability to rush the passer from ranging pre-snap alignments as mentioned above. He’s a movable chess piece with consistent, high-end play in several areas over the years, a piece that teams should and will jump to move into their system if given the opportunity this offseason.